← Recumbents for Rando and Ultra? NYGTF – Now You’ve Gone Too Far. This is the name of a PA Randonneurs Fleche team of which I am a member. 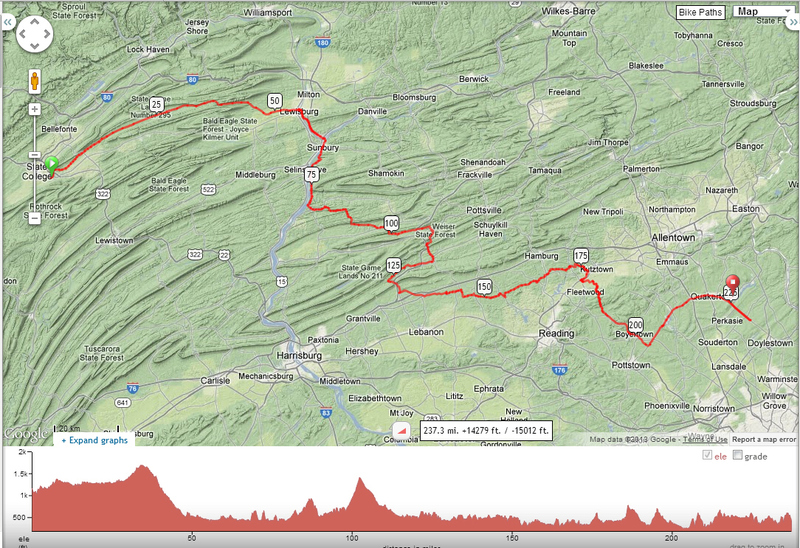 For those not familiar with the rules and format of the Fleche…It’s a 24 hour ride. It’s a team ride – at least three members of the team have to finish for it to be considered completed. It’s not usually ridden quickly. In fact, the rules can prevent you from riding too fast, in a sense. Given the time of year, we’ll spend a little more than half of our time riding in the dark. We will take breaks, but there is no extended sleep stop, per se. The emphasis is on teamwork, cameraderie, and enjoyment. I have not done a Fleche before myself, but the concensus from a lot of other randonneurs is that this is their favorite event. And it’s a great way to really find out how your early season training is going. It’s one of the most traditional types of randonee’s, with roots going back pretty far. As you can see, all teams have their own routes and their own start locations, and everyone finishes about the same time in Quakertown, where we all eat brunch on Sunday. Should be a nice time. We have logistics worked out pretty well. Herr Doktor Eric K, the fearless captain, has talked his wife into kindly driving a rent-a-van out to Quakertown to pick all of our sorry butts up on Sunday, late morning, after brunch, and take us back to State College (our start location). She’ll bring everyone’s drop bag containing a change of clothes. Showers can be obtained at the finish. There will probably be time for a cat nap. Luxury. I predict our pace will be very civilized. Because we designed a near minimum distance route (most design credit going to Herr Doktor), and the rules prevent you from stopping longer than 2 hours at a time (thus no extended sleep break) we’ll have little good choice but to ride slow and steady. So as a result, I think of it less of like a brevet, as more like a casual ‘endurance tour’. Controles / stops will be: Boalsburg (the start), Northumberland, Herndon, Tremont, Lickdale, Kutztown, Gilbertsville, Quakertown 22-hr controle (diner), Dublin (post office), and Quakertown (again, at the finish). The overall speed we need to meet with our planned route is only 9.9 mph. So even with 7 intermediate stops at 30 minutes each and the final stop of 1 to 1.5 hours at the 22nd hour controle (which is a lot of stopping), we’re only looking at a moving average of 12.5 mph. No problem. Plenty of time for screwing around, taking pictures, whatever, if needed or desired. After the fastest night-time riding four of us have ever done. The actual blog post has color-coding for the two voices “talking” about the Fleche, thus making it easier to follow the “conversation”. Thanks Martin. I will be sure to do a ride report. I hope our pace is nice and steady – with no misfortune induced increases in speed. With the awful early season weather we’ve been having around here, I am going into this ride with too few miles in my legs. I will be ok as long as the pace is even.